Connect Twitter To Feedburner Directly without using App! A few years ago, Google FeedBurner had a Socialize option that let people share their blog posts (RSS) directly on Twitter. But this service was depreciated, and people started using third-party apps such as twitterfeed instead. While these apps work fine, they leave you somewhat dependant upon them. Now though, it seems Google is throwing a new line out for Bloggers who'd like to share their RSS feeds to Twitter directly, because the Socialize option is coming back! This indeed marks another step forward for Google/Twitter Integration. Now, you can share your blog posts (RSS feeds) to Twitter without any third-party apps! First of all, to avoid any redundancy, you have to first remove any auto-scheduling apps for Twitter. To do this, log into your Twitter account, and click on the gear icon on the top-right corner. Then click Settings. Now, from the left sidebar, click on the Apps tab. Here, you will see all the Apps that you're using with your Twitter account. Next to each app is a Revoke Access button, which essentially deletes the app. 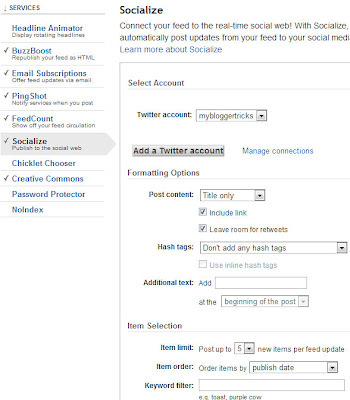 Delete any scheduling apps you're using to auto-share your blog posts to Twitter, such as twitterfeed. Log into your FeedBurner account, and select the feed you want to share on Twitter. Authorize the app for your Twitter account, and you're all done! Now, whenever you publish a new blog post, your FeedBurner will be automatically updated, and once that happens, the update will be immediately echoed on your Twitter account. I was using twitter feed....i seen this option in feedburner but didn't tried...:( Got a quesstion....Will this convert links to short links automatically while sharing..? Qasim Bro, i have placed feedburner subscription box on my blog. but when i post article on my blog, the full article goes to the recipient's email. so they read the full article there with out visiting my website. Is there any method by which i can send a part of my article to the recipients email? plz plz reply. But how we can make Tweets to be in real time from my blog.I see when i make a new post on my blog,then i not see real time tweet,he late.